Have you always wanted to pull up to a house at the end of the day, proud of the fact that it belongs to you? Bad credit can put your dreams of homeownership on the back burner for years, but fortunately, you can find plenty of home loans for bad credit in Ohio. You have to know where to look and how to keep your eyes open for the right deals that can put you well on your way to homeownership. All of the small decisions you make with your finances add up to create an overall picture of your financial health. Lenders use this number to determine whether you are likely to repay the loan on time. This is why it can be difficult for borrowers with low credit scores to find lenders willing to issue them a mortgage. The bank is attempting to protect its own interests, so you will need to do a little work on your overall credit first. The biggest categories for determining your credit score are your payment history and amounts owed. By addressing these two categories first, you can make a significant improvement in your overall credit score. It does require time to demonstrate that you can rebuild your financial habits and make them healthier again. Remember that you must do these two things consistently in order to see a huge difference in your credit score. Payment history is the biggest component of your credit score, so it’s time to start finding a system that allows you to make payments each and every day. Create a calendar that has all of the due dates listed and hang it on your refrigerator or somewhere else you’re sure to see it daily. Set alarms in your phone that remind you to pay the bills a few days before their actual due date. Enrolling in autopay might be the easiest solution if you routinely forget to pay the bills on time. 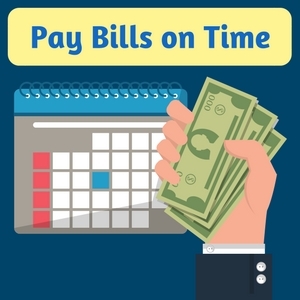 Many companies offer this feature to help make paying your bills easier each month. When you sign up, you give them permission to automatically withdraw the money from your bank account on a specific day each month. You don’t have to think about it and your bills get paid. It’s a win-win situation all the way around. The other major area where you can gain a quick credit score boost is by paying down some of your debt. 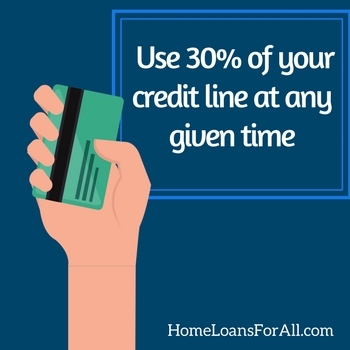 Experts recommend using only thirty percent of your available credit lines. Many individuals who have credit cards find that they are well over this recommended amount. Paying off some of your credit card debt so you can be back under this number is a quick and easy way to boost your credit score. Refrain from opening multiple new credit card accounts just to have an excuse to borrow more money. This will still reflect negatively on your credit report and score. How Can I Find Home Loans for Bad Credit in Ohio? 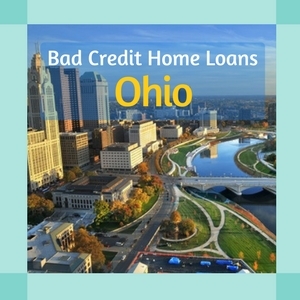 If you already know you have bad credit but still want to pursue homeownership, you need to know where to look for the bad credit home loans in Ohio. There are several federal programs that can help you to purchase a new home in Cleveland, Columbus, Cincinnati, Toledo, or Dayton. No matter where you want to live in the state, there is a perfect option for your home loans for bad credit in Ohio. The FHA loan program is a great option for a first time home buyer in Ohio with bad credit. This program is sponsored by the Federal Housing Administration who backs a portion of the mortgage. The government backing on these loans gives lenders more peace of mind to extend financing to borrowers with bad credit or first-time buyers. Not only are they more apt to issue the loan, but they are also able to extend a lot of benefits. Most people searching for home loans for bad credit in Ohio will like the FHA program because it has a very low down payment. Individuals with credit scores of 580 or higher only need a 3.5 percent down payment. If you are using the FHA loan as one of the bad credit home loans in Ohio, you might need a greater down payment as a compensating factor. Credit scores between 500 and 579 still qualify for the loan, but you will need a ten percent down payment instead. 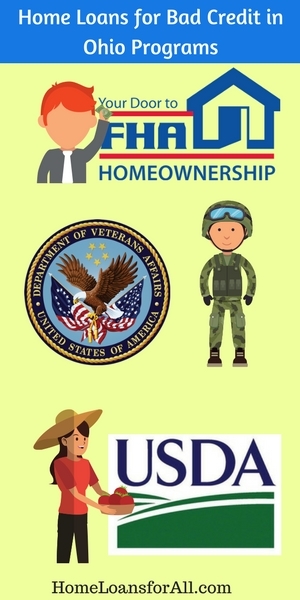 Similar to the FHA mortgage, VA loans are sponsored by the Department of Veterans Affairs. They agree to guarantee a portion of each loan for eligible veterans and service members which allows private lenders to issue great terms. You should look for the VA loan program when you are searching for bad credit mortgage lenders in Ohio. With the VA loan, there is no down payment required and no private mortgage insurance. You will find low interest rates that accompany these programs as well. Keep in mind that there are no minimum credit scores required for the VA loan program. The bad credit mortgage lenders in Ohio who offer this program are encouraged to look at your application as a whole before issuing a decision on your financing. A real person is responsible for determining your financial issues and whether any extenuating circumstances contributed to your bad credit. This can be a great way for you to get the help you need to purchase a new home in Cleveland, Columbus, or Cincinnati. Do you dream of living in Toledo or Dayton but wish you could live a little further from the city limits? The USDA loan from the United States Department of Agriculture could give you the help you need to purchase a home in a more rural area of the state. This loan program is designed to encourage prospective buyers to help modernize a more rural area, but only certain properties will be eligible. If you find a home that qualifies for one of these home loans for bad credit in Ohio, you can apply for this loan. It does not require a down payment and you might be able to add in money for any necessary repairs and renovations at closing. Much like the VA loan program, there are no minimum credit scores required for the USDA loan. Your application might be subject to manual underwriting if you have a low credit score though. This allows a real person to review your finances and determine whether you are responsible enough to repay the loan. This also means that your financing is highly subjective. If you are denied for one of these bad credit home loans in Ohio, you should try again at a different lender. How Can I Buy a Home Without a Mortgage? Have you found that no lenders are eager to issue you the financing you need to purchase a new home? The good news is that you do have two other options if getting a mortgage on your own isn’t a possibility right now. Here are two solutions to help you buy a home in top cities like Cleveland, Columbus, Cincinnati, Toledo, and Dayton, even when you can’t qualify for home loans for bad credit in Ohio. 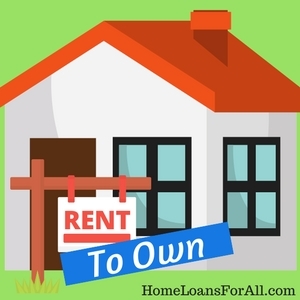 You can still get a rent to own home in Ohio with bad credit, even if you don’t qualify for a mortgage right now. Under this type of purchase, you will find a property listed for sale and sign a lease on it. The owner might ask you for an options fee upfront, which is sort of like a down payment for the new property. A portion of your monthly rent payment will also go toward the principal balance of a future loan. At the end of the lease, you will have the option to purchase the home if you desire. During this time, you need to be actively working on your credit score so you can qualify for bad credit home loans in Ohio. You might qualify for more favorable terms and lower interest rates after taking the length of your lease to work on your credit score. Meanwhile, you were able to make a home for yourself while you waited to qualify for home loans for bad credit in Ohio. Are you confident that your financial strife is behind you? You might be able to enlist the help of a friend or family member with excellent credit to help you qualify for a mortgage. When they cosign the loan, the lender also uses their credit score to determine your eligibility for the product. Depending on your own credit score, this could be the boost you need to get your own bad credit home loans in Ohio. 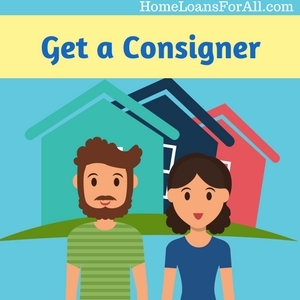 Bear in mind that your cosigner is responsible for your mortgage payments if you make them late or the home moves into foreclosure. Their credit score will be directly impacted by your financial irresponsibility. This should be taken into account before you decide to use this method. What State Programs Are Available in Ohio? The Housing Assistance Grant Program from the Ohio Development Services Agency provides some limited down payment assistance programs to low-income and moderate-income families. The grants are issued through the Ohio Housing Trust Fund. It also provides emergency home repairs and handicap accessibility project funding to qualifying homeowners. If you are a first time home buyer in Ohio with bad credit, you may want to look into the Ohio Housing Finance Agency loan. This program provides homeowners in low-income or moderate-income families with financing for their fixed-rate loan, down payment assistance, and a mortgage tax credit. Qualifying families may receive up to five percent in down payment assistance. You must not have had ownership of a property in the last three years, be an honorably discharged veteran, or purchase a home in a target area to qualify. You must also have a credit score of 640 or higher to qualify for many of their loan options. Homeownership education through HUD is a requirement to receive the loan. If you want to become a homeowner, there are lots of home loans for bad credit in Ohio to choose from. You should thoroughly investigate what each of your options are before deciding which one is right for you. Most people would agree that it is best to wait until you can raise your credit score to qualify for better loans, better terms, and better interest rates. This simple move might delay your dreams of homeownership by a few months or a couple of years, but it will ultimately save you thousands of dollars in the long run. 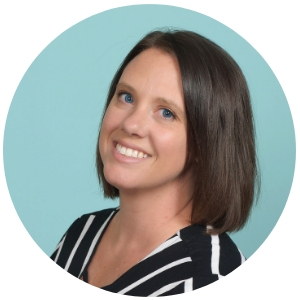 Are there first time home buyer programs in Ohio with bad credit? Yes, there are first time home buyer programs in Ohio with bad credit. You can apply for FHA loans, VA loans, USDA loans, or the Ohio Housing Finance Agency loan. Contact a lender for more details on these programs and the eligibility requirements. Where can I find bad credit mortgage lenders in Ohio? You can find bad credit mortgage lenders in Ohio by searching for lenders that offer the FHA, VA, or USDA loan programs that have no minimum credit score requirements. Can I purchase a mobile home with home loans for bad credit in Ohio? Yes, you can purchase a mobile home with bad credit home loans in Ohio.